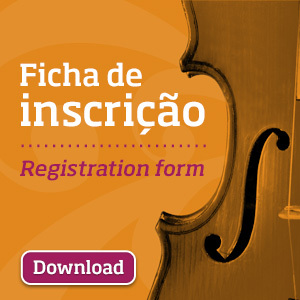 1 The 5th Chamber Music Competition “Cidade de Alcobaça” will occur between November 19th and 24th 2017, and is open to all interested, students and professional musicians of any nationality, which will be divided into 2 different categories: Junior – for those ensembles that do not exceed the age of 20 years old in average; and Senior – for those ensembles that do not exceed the age of 30 years old in average. 2 It will be accepted groups of 2 to 12 musicians, of any instrument, whose formation can not be altered at any stage. 3 The competition consists in the presentation of works as detailed in the following paragraph and follows three stages: a pre-selection from performances recorded in DVD format, a Eliminatory round and a Final round. 4 The program is of free choice, and ensembles can use original versions or transcriptions, being responsible for the quality and compliance with the norms regarding the reproduction of them. However, the organization reinforces the relevance of the presentation of works in originals in the widest range of styles and epochs possible. In both categories it is obligatory the presentation, in the Eliminatory round or Final round, of a work of a composer born or rooted in Portugal. 4.1 The DVD appreciated at pre-selection stage must comprise two works of contrasting styles that are allowed to be presented in the next stages and must be accompanied by an oath declaration which proves that the presentation is the sole authorship of the applicant group. 4.2 At Eliminatory round, two works of contrasting styles must be presented, by free choice of candidates, not exceeding 12 minutes of total time in Junior category, and 15 minutes of total time in Senior category. 4.3 At Final round, repertoire of free choice must be presented, not exceeding 25 minutes of total time in Junior category, and 35 minutes of total time in Senior Category. Works played in the Eliminatory round cannot be repeated in the Final round. 1 The applications must be sent to the address indicated in the registration form until October 23rd, being valid for application submission the postal services date of dispatch effect. Required documents: registration form properly completed and signed; a photo of the group; DVD for the Pre-selection stage; document proving the applicant’s age; proof of payment of the registration fee; updated biographies; a copy in good condition of the general scores of the works to be presented in the competition. 2 The application will only be confirmed after presenting all the properly completed documentation and the payment of the correspondent registration fee, non-refundable under any circumstances. 3 The members of each group are responsible for the costs of the feed and accomodation during the competition, as the transportation and the insurance of the instruments used in the rounds. 4 By signing the registration form, the applicants declare the acceptance of the present general rules and the authorization of the audio and video record of the presentations, as also the broadcast by the organization by any audiovisual means. 1 The application deadline is October 23rd 2017 and the announcement of the selected groups for the Eliminatory Round (maximum of 25 ensembles for each category) will be done on 4th November 2017. 2 The prized ensembles of the Junior category in the 2015 edition are automatically accepted in the higher category (Senior) in this edition of 2017. The winner of this category is also exempted of the respective fee, however the full application is required in any of the mentioned cases. 3 The draw of the Eliminatory Round will take place on 19th November 2017 at 6:00 pm at Cine-Teatro de Alcobaça – João d’Oliva Monteiro and the non-attendance of at least one representative of the group determines the immediate disqualification of the competition. 4 The subsequent rounds will take place at Cine-Teatro de Alcobaça – João d’Oliva Monteiro. 5 The Winners Concert and Awards Ceremony will take place on 24th November, at 9:00 pm, at the same venue. Absence of all the members of the groups awarded in this session, requires the immediate loss of any award that has been assigned. 1 The 1st Prize of the Junior category includes a monetary value of €2500 and a concert under the ambit of Cistermúsica – Alcobaça Music Festival (2018 edition); the 2nd Prize includes a monetary value of €1250 and the 3rd Prize a value of €750. 2 The 1st Prize of the Senior category includes a monetary value of €4000 and a concert under the ambit of Cistermúsica – Alcobaça Music Festival, Stellenbosch Chamber Music Festival, Festival de Estoril Lisboa and Maputo International Music Festival (2018 editions); the 2nd Prize includes a monetary value of €2000 and the 3rd Prize a value of €1000. 3 AVA-Editions will also award an extra prize in each category for the best interpretation of a Portuguese author’s work. This prize consists in the commissioning of a new work, to a current composer, to debut by the winning group. 4 The concerts provided by the awards have the full responsibility of the organizer entities together with the winning groups, since the organization of this competition has not any intervention and responsibility in the making of the same. 5 The Jury may award ex-aequo prizes. In this case, the value shall be divided equally among the winning groups. 6 All competitors will receive a diploma of participation and the winners will receive the respective certificate stating the classification obtained. 2 All jury’s decisions will be final and without appeal, reserving the right not to award any of the prizes if it doesn’t recognize enough merit to justify it. 3 Any omitted case in the general rules will be decided by the Organization. Any questions should be clarified by the Organization.